For me, the focal point of the kitchen is the stove and even more importantly the cook top. This is where it all happens in my home. At the end of the day my family congregates around the dining table, and we all get involved with cooking a hearty dinner (well, I cook it they eat it). I already have my own induction cooktop and because I’m so pleased with it, I decided to set-up the website you see before you now. It took a great deal of research for me to find the right cooktop for me, and that was kind of why the idea came to me that I should pass on some of the information I came across to everyone else who is looking for something that will make cooking more of a joy than a chore. 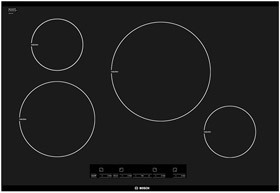 In this review, you’re going to learn about the Bosch NIT3065UC 300 30″ Black Electric Induction Cooktop and its counterpart the 500 series which comes in stainless steel. What I will say before we get going with what you can expect from this cook top is it’s not the cheapest out there, which is one reason I ended up going with the Max Burton 6200 Deluxe. I also chose this one because I was just looking for an additional burner in my kitchen rather than a whole cooktop with several (the Bosch has 4 hobs/burners). So, let’s move on to what you can expect from this Bosch model. If you’re the type of cook that often puts too much liquid in your pans, or you just forget when something is about to boil, this unit is the answer. The second it detects any type of overflow it will set off an alarm and immediately shut the power off. Kids! Yes, they love to touch things they’re not supposed to and Bosch has thought about this. This cooktop has a child safety lock included which stops naughty hands from switching it on, and when it’s in use the temperature settings are locked in. You may or may not know, but induction heating technology requires you to use cookware that’s compatible with it. This cooktop will automatically detect if you’ve placed something on the burner that won’t work, in which case it won’t power up. This also helps in terms of safety. If you’re anything like me, placing the odd metal spoon on the cook top is a regular occurrence, so having something that won’t heat just because its detected metal is REALLY useful! You also benefit from an over-heat shut-off feature which adds to safety, and if that wasn’t enough the controls will tell you if a burner is warm. Sure, it’s an induction cooktop, so you’re pretty safe anyway (the burner itself will not get hot, it will only get warm from residual heat from your cookware; more on that here), but it’s still a good feature in case you have something simmering for hours. Now on to a few specifications. There are four burners with this cook top all of varying sizes and the largest will take a pan that’s about 11 inches in size. Plus, you get a whopping 3600 watts of power. If you need an extra boost, all you have to do is make use of the SpeedBoost option which will boil water much faster than any conventional electric hob. If you’re worried about your carbon footprint (as well as your electric bills), you needn’t be with this cooktop because when you turn a burner on, it will only heat the size of pan you’re using. On first sight, you will understand why I have titled this review “add a touch of class to your kitchen”. 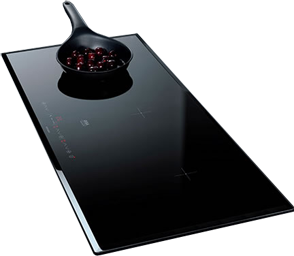 Once installed, this cooktop (regardless of whether you decide on the black or stainless steel version) will look sleek, elegant and practically sits flush to your countertop. There are no annoying knobs that stick out, just easy to use touch controls with 17 settings. The stainless steel model is a little more expensive than the black, but that’s due to the additional trim you get which adds to the overall look. If you want to find out more, you can take a look at Amazon here for the regular model and here for the one in stainless steel. You will find comments from very satisfied customers and some great discounts.